Overview (No Spoilers): In The Fool’s Assassin, Robin Hobb has created a fantastical world full of intrigue, scandal, and magic, which fits snuggly right between the young adult realm of the Fallen Kingdoms and the intricately detailed and complex world of the Fire and Ice Series. The story follows an aging assassin for the royal crown as he attempts to isolate himself from the terrible deeds he executed in his youth. As his past catches up with him he loses his grip on the calm, normal life he had carved out of the rural countryside. 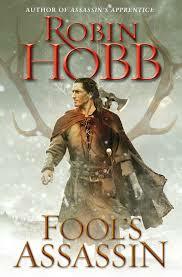 Overall, a great read which left me eager to start the sequel, The Fool’s Quest. For supposedly being a talented and deadly assassin, Fitz’s continual lack of attentiveness and observation toward his surroundings seems out of place and honestly is excruciating to read. If the Fool is Bee’s father, how did Molly become pregnant? Bee is so very unique, how does no one connect the pieces to see she might be a White Prophet? With all my being I wanted one of the characters, i.e., Bee or Fitz, to pick up the rock that the Fool carved again. The scene with Fitz picked up the carved rock, after the disappearance of the first messenger. What happens to sweet, poor Perseverance? Who are Lant’s and Shun’s parents? Both characters were built up to have significant importance, however both grating individuals left much to be desired. For all the reader knows, Lant was killed at the end of the Fool’s Assassin.